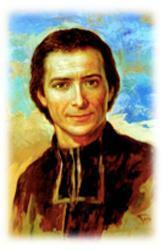 Marcellin Champagnat was the founder of the Marist Brothers. Marist Miramar merged with Holy Cross School to make us one whole school. In 1818 Marcellin Champagnat opened the first Marist schools, the timetables he designed in such a way to fit the farming needs of his parishioners (such as allowing children of schools to help in fields at planting and harvesting time). Marcellin was born in 1789 in the village of Le Rose near the city of Lyons in France. Marcellin's concern for the education of children and young people was rooted in his own educational experience. Because of the French Revolution, Marcellin did not attend school until age 11, and that experience lasted only one day! Poor health led to his death in 1840.